This “4 bank” shop charger initializes new sealed & filler cap powersport batteries in 1 hour, plus desulfates & recovers neglected batteries. 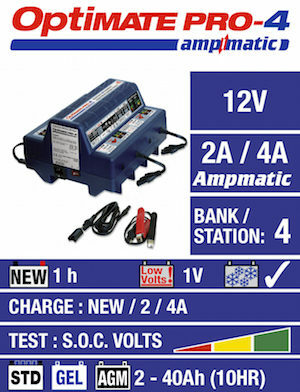 SKU: OMPRO4 Category: Workshop Battery Chargers Brands: Optimate. 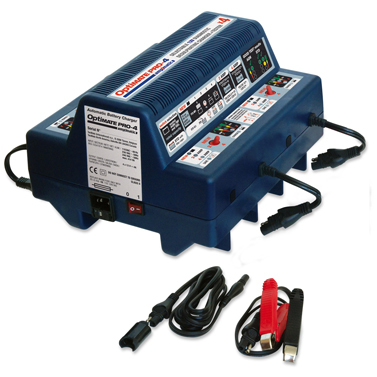 The high voltage and pulsing recovery mode of the Optimate Pro 4 is able to save a neglected sulfated 12V lead-acid battery unable to accept charge from a standard charger. 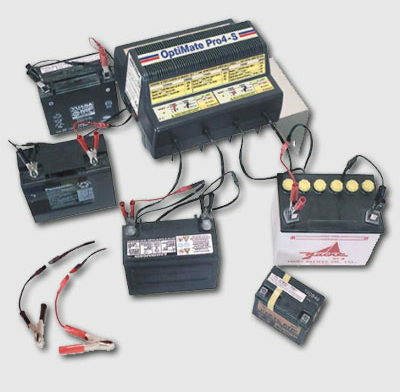 If necessary, 2 or 3 stages of high voltage and oscillatory pulsing are applied to recover neglected, flat batteries (disconnected from the vehicle) from sulfation to a chargeable state. This NEW 4-bank shop charger initializes new sealed & filler cap batteries in 1 hour, plus desulfates & recovers neglected batteries. Select NEW or USED battery selection. Select NEW and a battery receives the correct initialization charge within 1 hour. The USED program allows optional selection between two sizes of battery (<10Ah>) and the rest is automatically done for you. 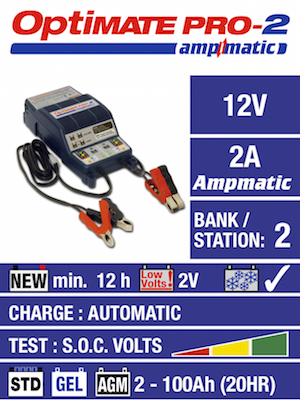 Battery power is optimised during bulk, absorption & cell balancing charge modes by the micro processor controlled AMPMATIC program, a unique feature that automatically ensures the battery receives optimal current every second, and then tests to verify charge retention. A metal wall bracket is available for easy & convenient wall placement and the unit comes with battery clips that have a cable reach of over 8ft / 2,5m. 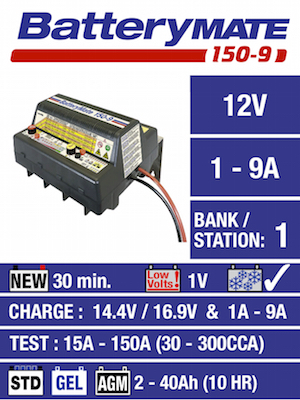 MAX charging time is 1 hour with maximum current automatically set at 4A. The Ampmatic program varies current according to battery impedance to bring the battery to full charge as quick as possible without ever overcharging the battery during the first charge cycle. 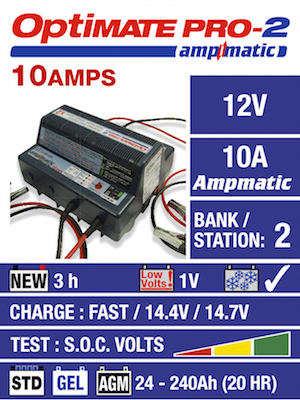 Bulk mode – current is controlled by the Ampmatic program until the battery voltage has risen to 14,3V. Depending on the capacity of the battery this usually occurs within 30 minutes. Absorption & cell equalization mode – for 10 minutes the voltage cycles between 13,6V & 14,3V as the Ampmatic program varies the current. This cyclic action effectively activates new battery cells below the natural gassing level of the acid, ensuring that no pressure build up occurs in sealed batteries and overflow in standard filler cap batteries is reduced to the absolute minimum (if the battery was not initially overfilled and sufficient time was allowed for the acid to settle after filling). If during the 5 minute verification mode the current demand from the battery remains high, charging returns to absorption / equalization mode until the 1 hour charge period has expired. 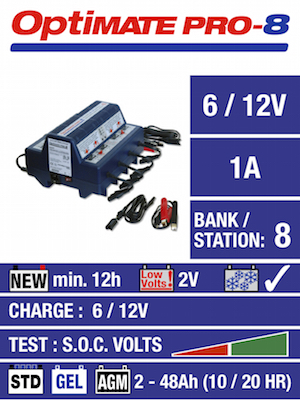 Test period: for 10 minutes charging is suspended and the voltage is monitored. A good test result indicates the battery successfully accepted the first charge. A fixed low current (200mA if 2A selected, 400mA if 4A selected) is injected into the battery to determine battery impedance / charge acceptance. Absorption & cell equalization mode– for 10 minutes the voltage cycles between 13,6V & 14,3V as the Ampmatic program varies the current. This cyclic action effectively rebalances used battery cells whilst remaining below the natural gassing level of the acid mixture, ensuring that no pressure build up occurs in sealed batteries and overflow in std filler cap batteries is eliminated (if the battery was not overfilled prior to charging). The extended test will expose suspect batteries that may seem to hold charge (following recovery), but lose power due to irreversible internal damage once the temperature lowers down to normal.